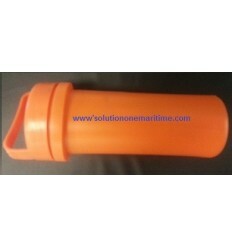 Inflatable Boat Emergency Repair Kits There are 17 products. 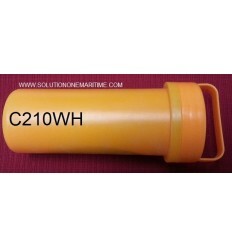 Zodiac Emergency Repair Kit PVC Z6730 Delrin valve repair kit. 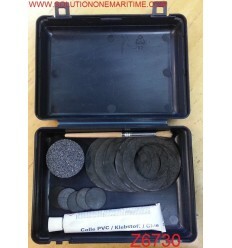 Includes 1 part glue, pumice stone, 5 rubber valve seals, 5 rubber valve cap seals & an application brush. It does not come with any patch material. Achilles Emergency Repair Kit Hypalon (CSM) Red/Black C210RD Includes glue, red and black patches, sandpaper and orange plastic storage tube. Achilles Emergency Repair Kit Hypalon (CSM) White/Gray C210WH Includes glue, white and gray patches, sandpaper and orange plastic storage tube. 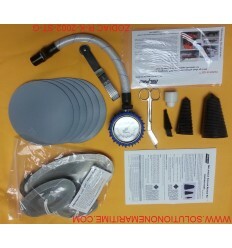 Zodiac Hurricane Major Emergency Repair Kit Hypalon Grey R-K-2002-ST-G This kit comes with what you see. Various leak plugs, a gauge, etc. 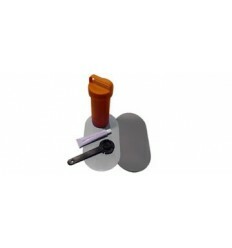 No glue is included with this kit as it is for situations where even emergency gluing cannot be performed. 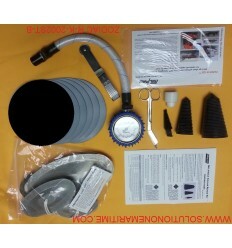 Zodiac Hurricane Major Emergency Repair Kit Hypalon Black R-K-2002-ST-B This kit comes with what you see. Various leak plugs, a gauge, etc. No glue is included with this kit as it is for situations where even emergency gluing cannot be performed. 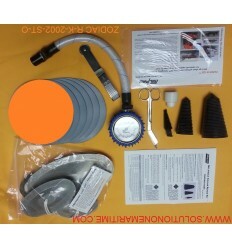 Zodiac Hurricane Major Emergency Repair Kit Hypalon Orange R-K-2002-ST-O This kit comes with what you see. Various leak plugs, a gauge, etc. No glue is included with this kit as it is for situations where even emergency gluing cannot be performed. 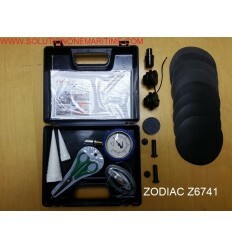 Zodiac Emergency Repair Kit Hypalon Z6741 Repair kit. Includes: pumice stone, 8 five inch Hypalon patches, one pair of scissors, one patch-n go kit, one small clamshell leak stopper, one large leak plug, one small leak plug, two transom cuff bolts, two delrin valves and one air pressure gauge.